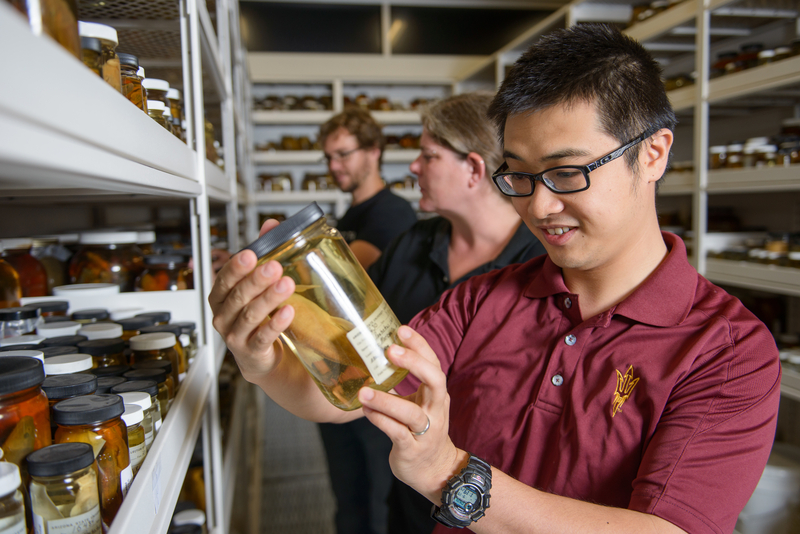 Arizona State University’s Natural History Collections are some of the best in the world, and boast nearly 1.8 million specimens among nine collections. Some of the largest include the Frank Hasbrouck Insect Collection, with close to one million specimens, and the Vascular Plant and Lichen Herbaria, with more than 400,000. Plant fossils, shells, reptiles and amphibians, fish, birds and mammals are also represented. 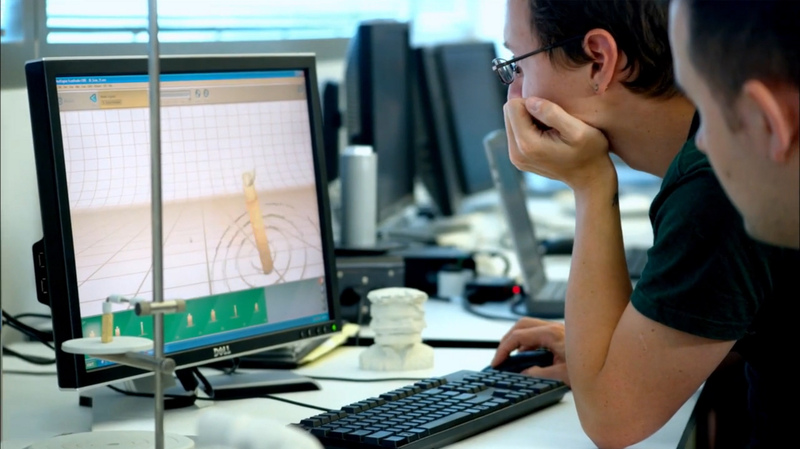 Specifically, with help from students and volunteers, ASU collections employees are working to improve scientific literacy in the community through targeted outreach programs and the use of innovative 3-D learning tools. At an Oct. 2 grand opening, guests will get a behind-the-scenes look at the different collections and meet many of the researchers who curate the specimens. The remodeled Alameda Building now has a climate-controlled environment, space for teaching and community outreach, and plenty of storage to house existing specimens and allow for growth. In addition, the facility includes many safety and security improvements. Scientists at ASU are also improving the collections by digitizing specimen records and images – adding them to online, public databases. For decades, collections records were maintained on paper, but now, online collections from around the world can be viewed in one place. The $3.5 million renovation was completed in approximately eight months. Project participants included RSP Architects and Brignall Construction Co. From ASU, project manager Anthony Gasca; Thomas Dowling, former director of collections; SOLS Facilities representatives Barbara Markley and Scott McAdams; Marty Wojciechowski, associate dean for Facilities in the College of Liberal Arts and Sciences and collections curators and their staff, including Les Landrum, Kathleen Pigg, Nico Franz, Walter Fertig, Charlotte Johnson, Elizabeth Makings, Sangmi Lee and Melody Basham. The Oct. 2, 2014 Alameda Building Grand Opening begins at 4:45 p.m. with a ribbon-cutting ceremony at 5:30 p.m. Doors close at 8 p.m. The Alameda Open House is located at 734 W. Alameda Drive in Tempe. To attend, RSVP here. A new online science education initiative, spearheaded by Arizona State University, aims to help college students succeed in introductory science classes across the country. An innovative online course, successfully developed and deployed at Arizona State University, is the basis of a far-reaching online science education project that is a finalist for a major grant from the Bill & Melinda Gates Foundation. The group will establish the Smart Science Network, a digital teaching network that will develop and deploy innovative online courseware to improve the learning outcomes of low-income and disadvantaged college students in high-enrollment introductory science courses across the United States. Smart Sparrow was one of three ASU technology partners to be included in the Gates Foundation’s list of finalists. The others are: Acrobatiq, a Carnegie Mellon company that designs customizable, adaptive courseware; and CogBooks, which is designing a project to provide top-quality courseware to U.S. college students at affordable prices. “The whole learning experience will be designed in collaboration with ASU, drawing on their extensive experience in online learning, flipped classroom models and innovative teaching methods,” CogBooks said in announcing its recognition by the Gates Foundation. Key principles include: organizing curriculum around “big questions” at the frontiers of knowledge that cut across traditional disciplines; teaching concepts through rich, game-like interactive, adaptive online lessons and simulations; and deepening and evaluating concept mastery by applying knowledge in project-based learning. Ariel Anbar, an ASU President’s Professor, will play a pivotal role as the academic lead of the Smart Science Network consortium. Anbar and Lev Horodyskyj, both in the School of Earth and Space Exploration in ASU's College of Liberal Arts and Sciences, created Habitable Worlds, which has been offered to more than 1,500 ASU students since 2011. The ongoing development and evaluation of Habitable Worlds is supported by NASA’s Astrobiology Program and the Directorate for Education and Human Resources of the National Science Foundation. In addition to Smart Sparrow and ASU, the Smart Science Network includes Achieving the Dream, Inc.; 23 additional colleges and universities, many of whom are in the Achieving the Dream network; and a research and evaluation team led by George Siemens, a world leader in learning analytics, at The University of Texas at Arlington.